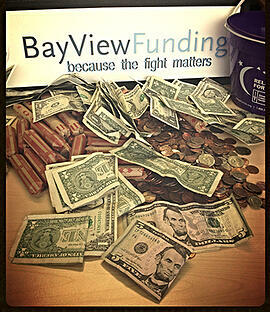 This year, the annual Bay View Funding Staff Penny Wars is taking place during the month of March. The team is warring with pennies once again. As in years past, the battle of the pennies will result in a company wide contribution to the American Cancer Society. The Bay View Funding Penny War for 2015 involves 8 teams. Each team collects pennies and adds them to their team penny jar. One point is received for each penny collected. However, the ‘war’ involves teams sabotaging each other for a weekly win by placing ‘silver’ coins or dollar bills into rival containers. Each ‘silver’ coin or dollar bill counts as a negative amount. For example, a nickel subtracts 5 points, and a dollar bill would subtract 100 points, etc. Totals are posted weekly, and treats are handed out to the winning weekly team, thus encouraging more money to be collected while also creating a healthy amount of competition. Lynn Richard is the proud organizer of Bay View Funding Penny Wars, and other fundraising events that take place here. Lynn is a cancer survivor, and very much enjoys encouraging activities that help raise cancer awareness while also bringing different groups within the office together. The charity of choice means a lot when the reason to raise money becomes personal. Everyone is working hard to achieve the goal of $1000.00. Two weeks in, the pennies are beginning to pile up and Team 7, with stealth strategic moves, is leaving rival teams in the dust! The big incentive this year is that the overall winning team will be able to leave early on a Friday of their choice, and who doesn’t want to extend the length of the weekend! An inter-office Penny War is such a fun way to raise money for the charity of your choice. Consider starting a Penny War in your office.